In the blink of an eye, we've come to the last quarter of 2018. How amazing does time pass us by, right? The year end is always a very busy time for me and this time, not only do I have to coach the firstborn for her year end exams, I also have to settle the school admin stuff for the secondborn who is going to Primary 1 and the youngest who will be going into nursery next year, and all these go on top of having to plan for their birthday parties. Nonetheless, I still wish to keep these "Happiness is..." posts coming because they help me to remember the things we've done and keep my life in perspective too. Looking back, we did a whole lot of things in September and I think one of the messages I kept getting was the importance of believing in yourself. It's one of the values I hope to inculcate in the kids and also one that I have to keep reminding myself of, as I tread this journey of being a stay-at-home-mum who might not always be understood by others and who might lose faith in herself every once in a while when the going gets too tough. Nowadays, I keep telling the girls to stop saying the words "I cannot", "I don't know how" or "Mama, help!" but instead, practise saying "I can", "I'll try my best" and "I will find a way myself". After all, when we believe in ourselves, anything becomes possible. 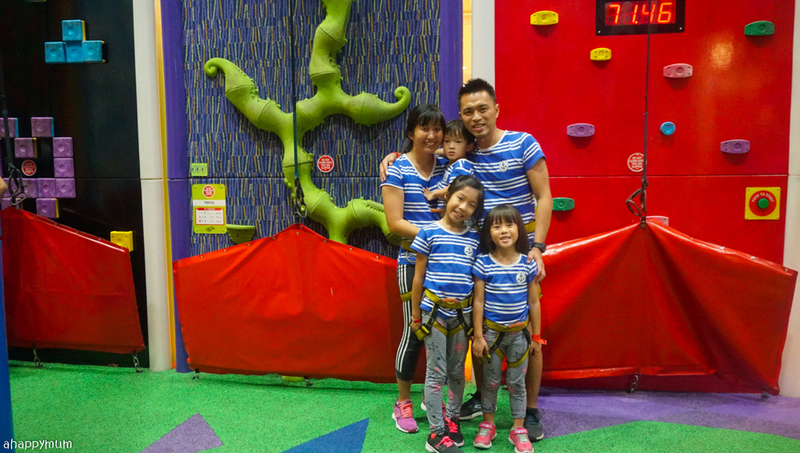 I was so glad that we managed to find a day to go back to Clip 'n Climb at HomeTeamNS in Tampines Hub again! This was because I lost all our precious pics and vids when my phone got stolen on our first visit and that was definitely a bummer because first experiences are always so precious. Still, it was awesome to go back again to make more memories and the best thing was by a stroke of luck, the hubby happened to be able to take leave and join in the fun with us and our friends too! Woohoo! What I love most about this rock climbing session is seeing how it pushes the little ones, and even myself, to scale greater heights, persevere and show our grit when there are obstacles ahead of us. I saw how the girls got stuck yet tried to hang on while thinking of other ways to get around, I saw how they would at times whine and tear and eventually give up, I saw how they would pluck up enough courage to try the same course again, I saw that priceless look of achievement on their faces when they conquered all odds to press the button at the top of the wall. It was such a great way to build up their self esteem, strengthen their determination and remind them that when they believe in themselves, they don't just climb rocks but move mountains too. We made time on a weekend to go back to our old neighbourhood and also visit our old house (thanks to the new owners who are such a friendly couple!) and send our congratulations to our previous neighbour who just gave birth to their second child too. 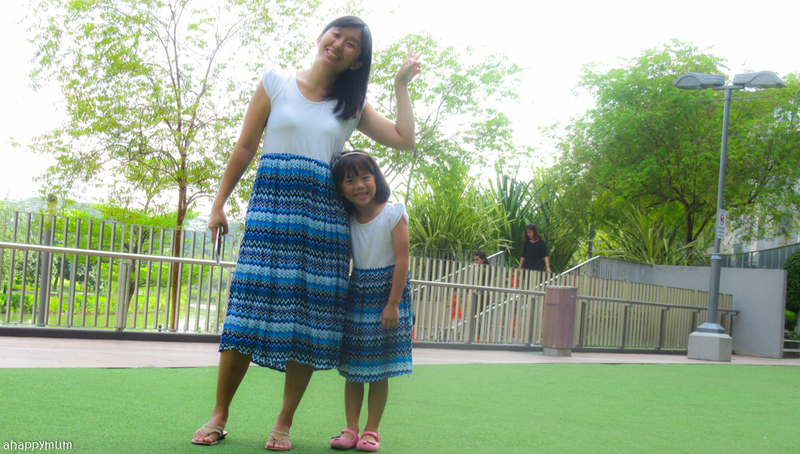 The girls were just happy to be able to go to one of our favourite hangouts last time and it's this seemingly small, simple yet fun playground that we loved to visit. 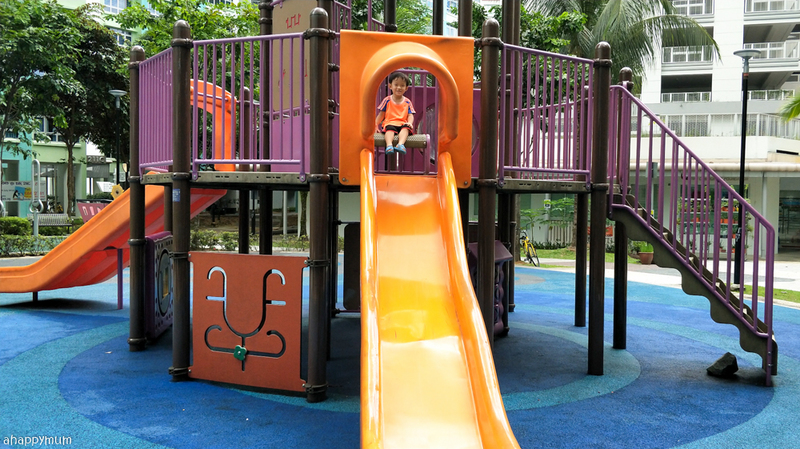 All of them did something new that day and for the toddler, he learnt to climb up a ladder - which took him quite a while to get over his fear because this boy is quite hesitant and nervous when it comes to trying new things. 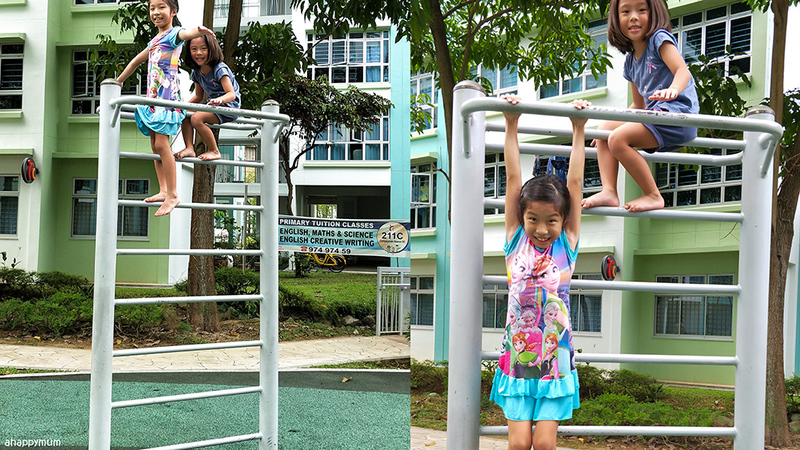 As for the girls, they were just happy to climb up all the pull up bars (by themselves!) 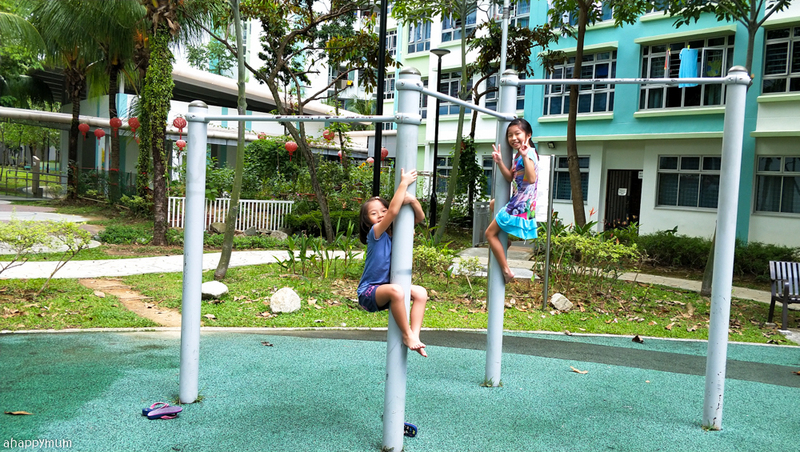 and even did new tricks like hanging on without hands or moving across all the bars (like monkeys lor) without falling. Guess what? The firstborn did so much of it that she ended up with blisters all over her fingers - and she was going to take her compo exams in a couple of days. I wanted to let her learn that it was her choice and probably a small price to pay for that sense of accomplishment that she gained. If time could rewind, I believe that she would have chosen to do it again even though she knows that she might get hurt. That's the kind of spirit that I don't wish to dampen but instead, encourage her to keep going. We've been scooting around in our neighbour so much in the last month and it's a joy for me to witness how each of them have progressed. The big girl has taken over my adult scooter (because we only got two kids' ones lar), the little girl has moved on to a bigger two-wheeled scooter while the boy now scoots confidently on his own and doesn't need me to hold his handle or push him along anymore. He took a while to learn this and I remember being a little worried about why he was learning things much slower than his sisters when they were his age but time and again, he has shown me that when the time is ready, he will blossom in his own unique ways. I just have to be patient and wait and learn not to compare. Anyway, we scoot out to eat on some days so usually, we have to cross quite a few roads - and some of them are busy cross junctions. 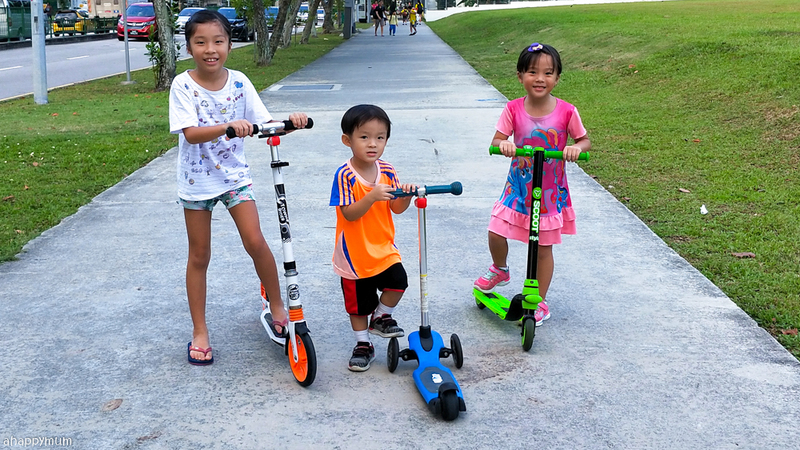 If we are scooting, it means the hubby is not with us and that also means I am all alone with the three kids. We've kind of gotten so used to it after so many sessions and they now know they need to stop a few steps behind every yellow line or road crossing, they have to wait for everyone to gather before moving off again and they have to listen to all my instructions if they wish to keep scooting. Haha. I still have to nag aplenty and shout at them if I see any sign of danger, but so far, I still find it an enjoyable experience to bring them out - even though it means I have to walk fast to keep up most of the time - and I hope these outdoor sessions make them feel happy too. On the spur of the moment while shopping at the wet market, I bought home 2.5kg of soybeans (it cost me $10!) and set up this sensory play corner for the kids - complete with trays, buckets, shovels, cups, sifts, bowls, and even a spiral slide from our Play-Doh stash. I'm not sure to call it a smart move or not because no matter how much I tell them to be careful, I still end up having to tidy all the beans at least once a day. 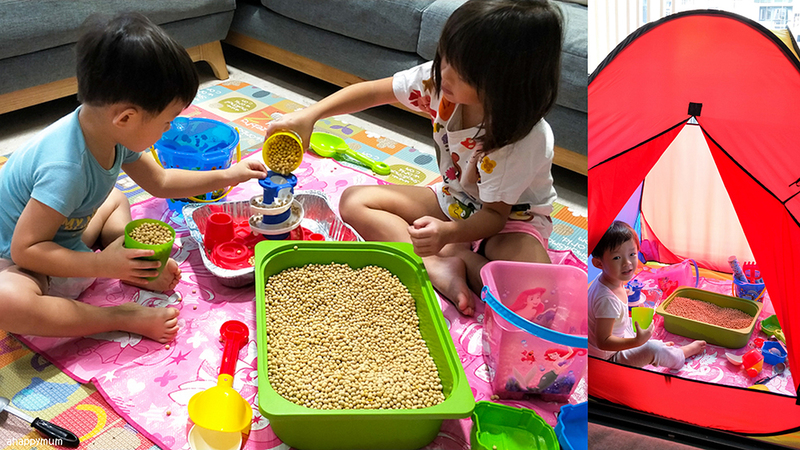 It's better now that I bought a shower curtain from Daiso to place underneath and I try to contain everything in our tent, but still, I find the beans all over my living room and even in weird places like the boy's diaper! Lol. But guess what? The smiles on their faces definitely make things worthwhile and I'm proud to say that one month on, we are still going strong on this and the corner is still very active and has become one of their favourite places to play. I just have to believe in myself that I can continue to do this without going insane at seeing the mess made by thousands of beans and to be on the positive side, it's actually quite therapeutic having to scoop them up and place them all together too. 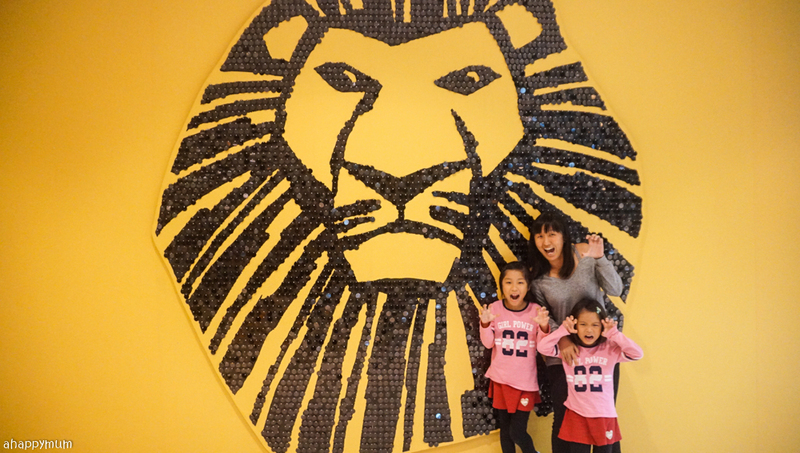 I took my daughters out on our much anticipated girly date where we went to watch The Lion King musical! It was one of the best shows we've even seen even though I bought one of the cheapest category and we were seated high up. I've always loved the story of how Simba lost faith and forgot who he was but went on a journey of self discovery and eventually found the courage and strength to face his fears, take back what was his and become the king that he was meant to be. Yup, believe in yourself and never forget who you truly are, my dears. 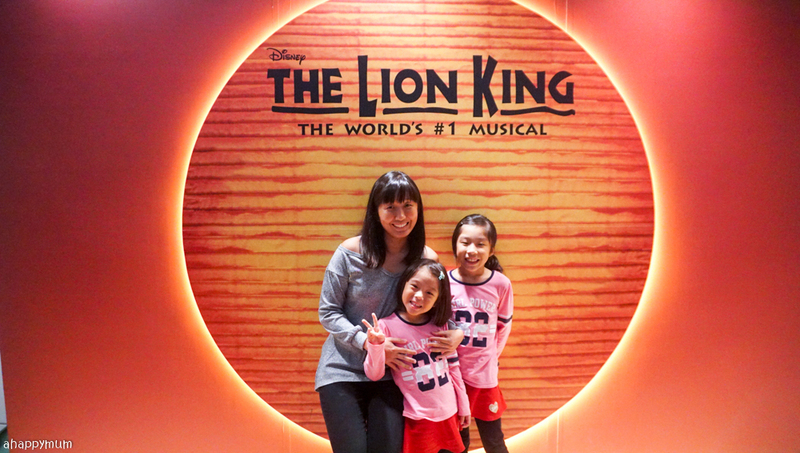 I am so glad the three of us enjoyed the show tremendously and I think we need to plan for our next girls date soon! 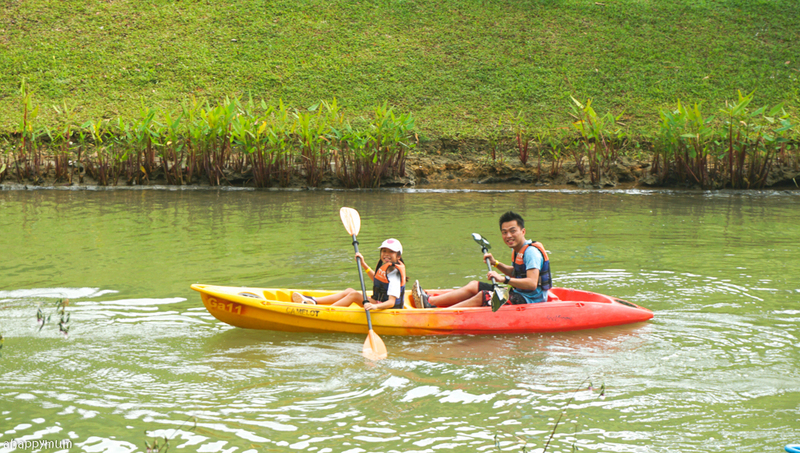 Thanks to Dads for Life, the hubby and the big girl went for their first ever father-and-daughter kayaking session! She was initially apprehensive and worried if she would be able to help in the rowing, and even though it did turn out to be hard as the paddle was heavy for her to hold, I was just happy to see that she tried her best and enjoyed it too! If only it didn't start to rain halfway and they could have finished the entire session, but oh well, safety comes first. I'm looking forward to letting these kids experience more firsts and remind them that they are able to achieve more than what they imagine. 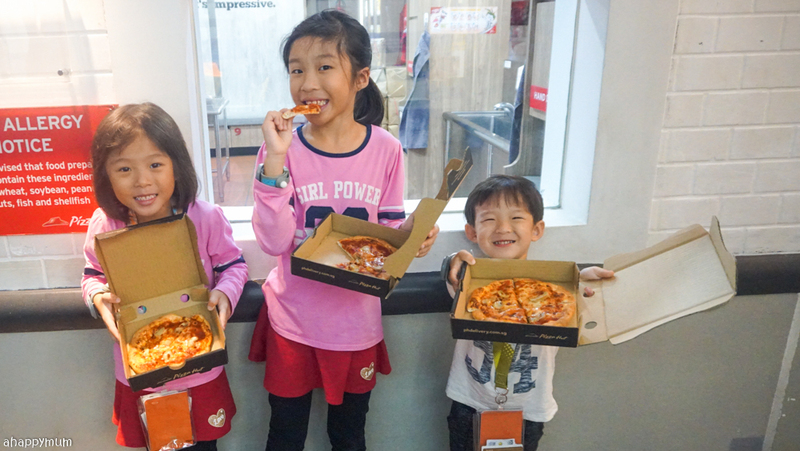 We went for our first family night at Kidzania and it was mad awesome (read about our experience here)! 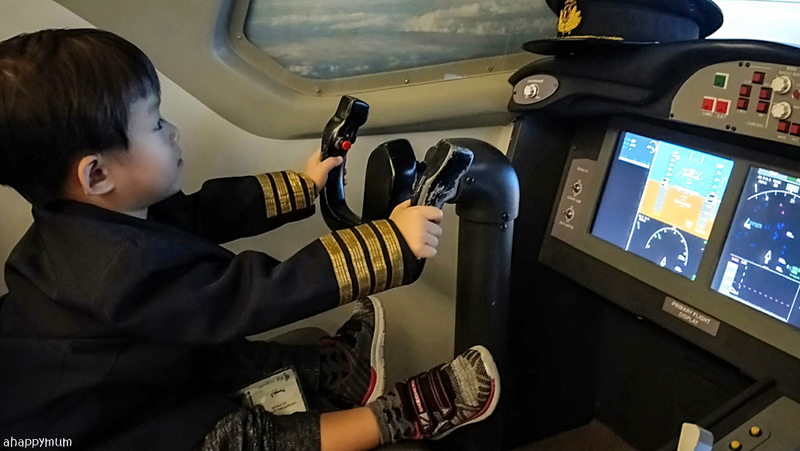 Although some might deem Kidzania to be a place that offers more bad than good for the little ones because of all the branding association and commercialised activities, we still love visiting this big city just because it gives the kids a chance to be anyone they want - chef, pilot, doctor, firefighter, photographer, dancer, actor, policeman and more. I do wish they had more in depth learning opportunities where the kids get to gain more practical skills and knowledge, but seeing how bustling and crowded it can get, I guess we are very contented already and it just means we have a reason to visit again! I hear the kids talking about their ambitions every now and then and I think it's a good way for them to be exposed to more occupations and a reminder for me to remember to encourage and support them, regardless of what they choose to do or where they choose to go when they are all grown up. 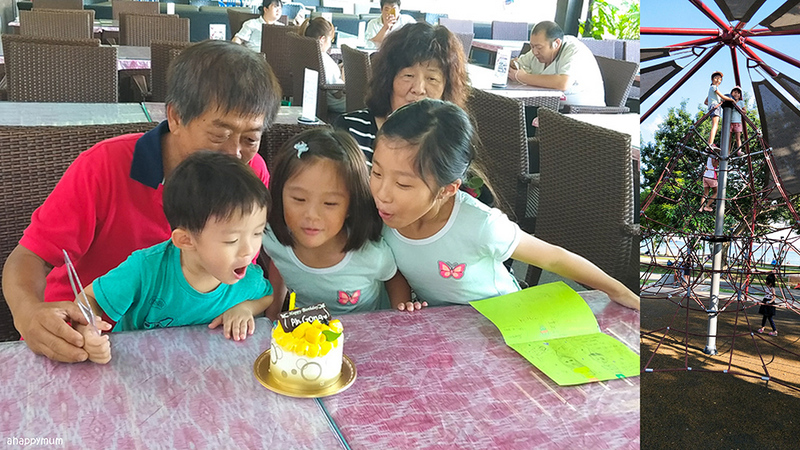 It was my dad's birthday so we treated him to a nice Peranakan meal in East Coast and had a simple cake cutting ceremony too, before the kids proceeded for some fun at the Marine Cove playground. I let the girls compete against each other on the spider web structure where they would race to climb up to the very top and then race to come back down after. There was this auntie next to me who asked "Your girls are so brave! 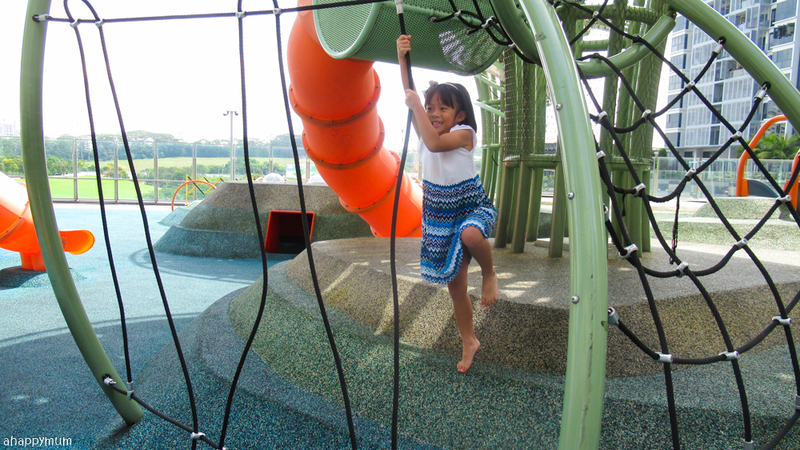 See lar, my granddaughter don't dare to climb up. How do you teach them?" Actually, I don't teach. I just let them try, let them fall and make sure they don't give up but try again the next time. 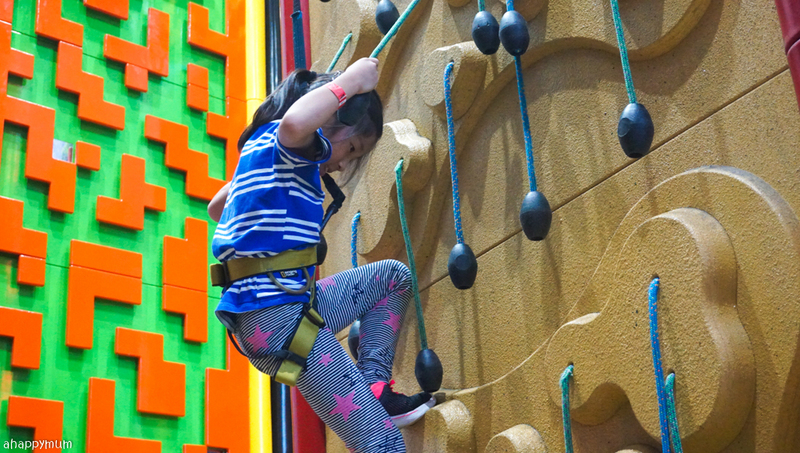 It was also interesting to see how her granddaughter, who is the same age as Ariel, was motivated to go higher when she saw the girls climbing up at such a swift speed. It goes to show how kids can be influenced by one another and that peer pressure is real! Haha. For our Mid Autumn celebration, we invited the hubby's brother's family over for dinner and together with the in-laws, all 12 of us went out for a night walk with our lanterns! 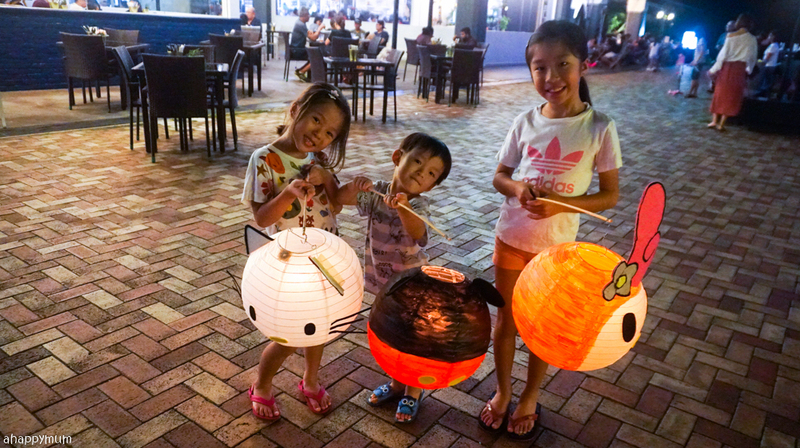 I was surprised to see how the kids still loved our DIY lanterns from four years back and I actually prefer them to have lanterns that use real candles instead of the battery operated ones. Why? Got more feel, can see the light flicker, and need to do some work by taking out the old candles to replace with new ones mah. That is where the fun lies in, isn't it? It's also a reminder to me that whenever we feel burnt out in life, we just need to take a break, recharge, rejuvenate, regain our energy and we'll be ready to take on the world again. 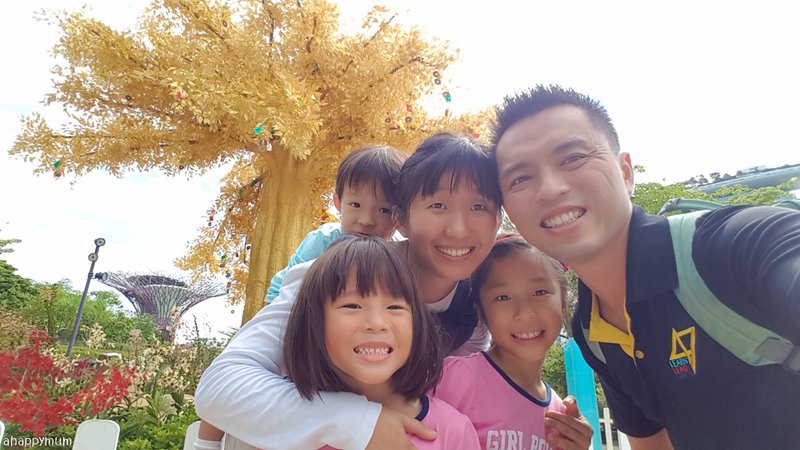 This was a golden tree which we saw when we were at Gardens by the Bay and it was said to make your wishes come true. Do you believe in this or in stuff like wishing fountains? I am not very sure, even though I do make use of any opportunity to wish for good health for my loved ones. Most of the time, I still believe that dreams come true only if you work hard for it. Yup, so once again, the key is to believe in yourself and to push yourself to attain the impossible. After making use of a promotion to renew our GBTB annual passes (2 years for the price of 1! ), we were delighted to be able to visit the domes again! I must say I don't have green fingers in the least and I also don't really like to receive flowers because I know that they will wilt in a matter of days - which means a waste of money in my view. 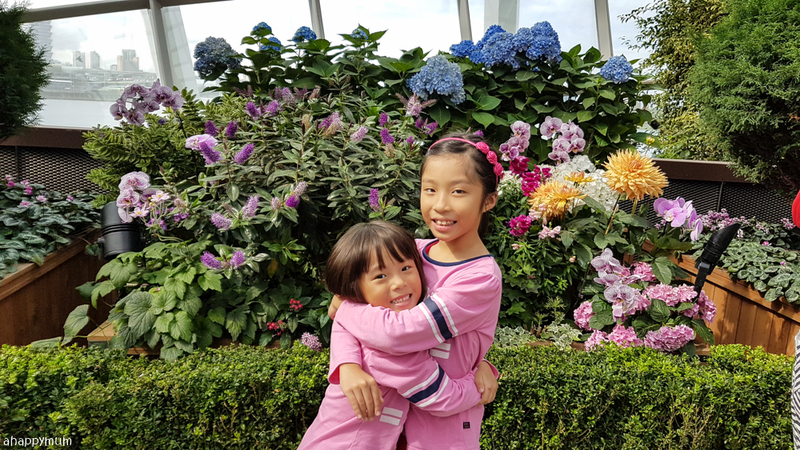 That said, I do love to take photos of my kids with lots and lots of beautiful flowers! Haha. These memories are lasting, you know, and that is precious in my dictionary. The Sunflower Surprise exhibition is one of my favourite ones so far and I love seeing the field of pretty, yellow, striking sunflowers in full bloom - each of them unique and unlike another. 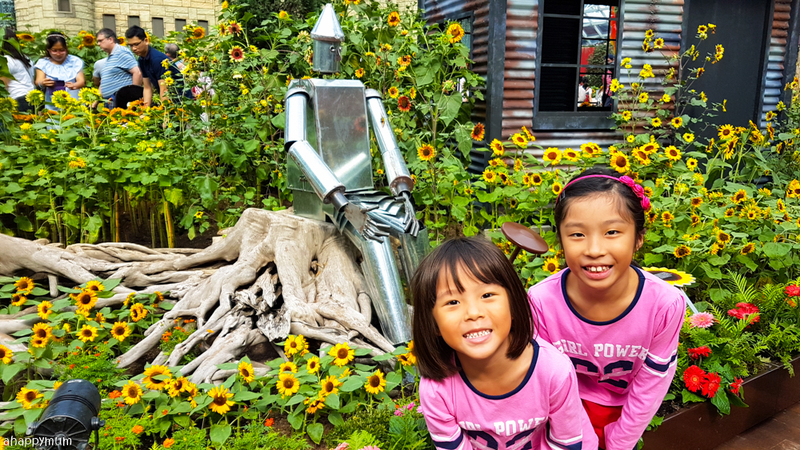 The story of the Wizard of Oz was also seamlessly weaved into it and we walked down the yellow 'brick' road, visited the Wizard's Castle and also came up close with characters such as Lion, Tin Man, Dorothy and Scarecrow too. What would you wish for if you could pay a visit to the Wizard too? 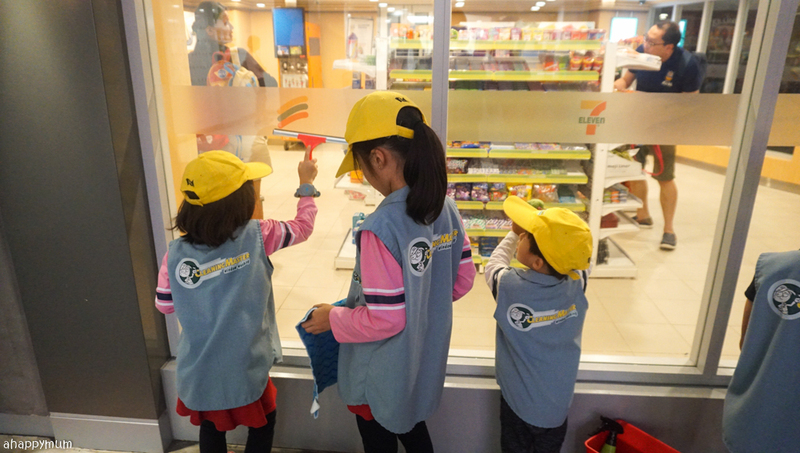 In wanting to fulfill my promise of having one-on-one dates with the kiddos, I also made sure I forked out one morning to take the little sister out for her favourite 鸡蛋面包 breakfast, went to the playground and had fun at the arcade in the hope of filling up her love tank. 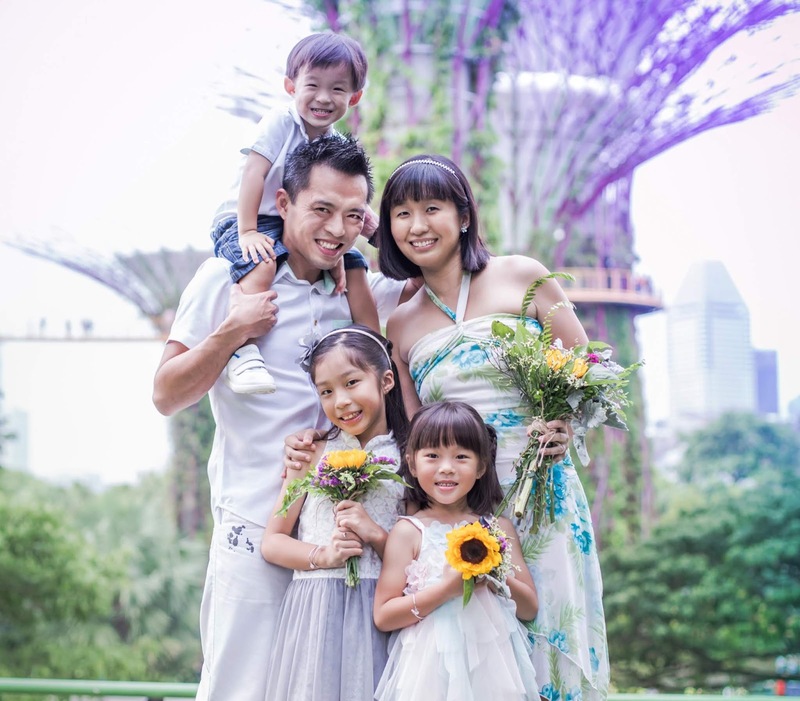 I used to think that it was kind of impossible for me to leave two kids aside and bring just one out but as time passed by, I started to realise that sometimes, it's not so much about whether it's feasible or not but if I'm willing to do it in the first place. 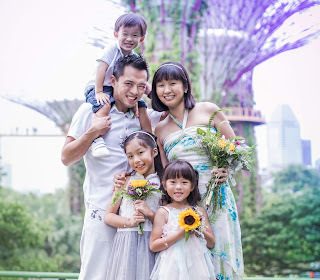 In any case, the hubby is usually around on weekends and all I have to do is ask him to look after two kids for a couple of hours while I take the third out for an one-on-one date. After doing a round of dates with each of the kids, I know that all of us enjoyed the sessions lots and it's actually for the good of everyone to continue with such precious one-on-one time. It might be just once in half a year or even less, but at least we are onto a start and I'm thankful for that. 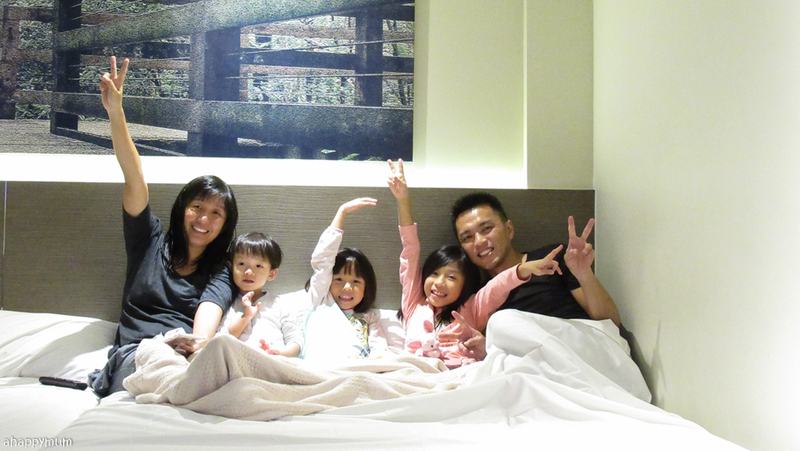 During the September holidays, I also challenged myself by bringing the brood out for a chalet getaway! 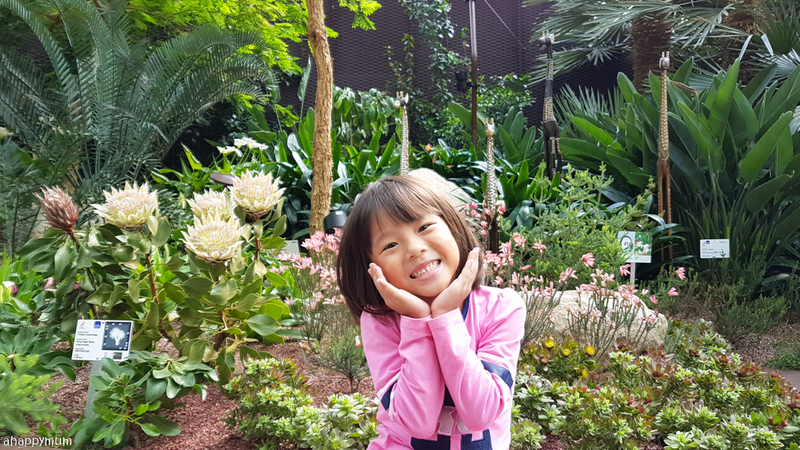 Armed with two luggages, a stroller, a diaper bag and a few bags of snacks, the four of us took a taxi to D'Resort at Downtown East in Pasir Ris and we were very excited as it was our first time staying there. The only problem was.... the kids are a little sick, especially the boy who couldn't stop coughing, had plenty of phlegm, didn't have a good appetite and just basically seemed lethargic most of the time. 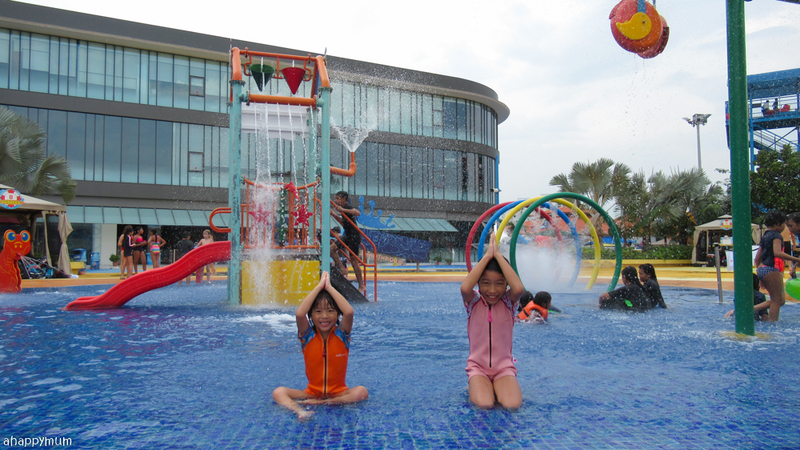 I did have a choice of whether to continue with the staycation or not and perhaps it's for selfish reasons, but I really didn't want to waste the money and I pretty much assumed that everything would be fine and I would be able to take care of them while still letting them have as much fun as possible. 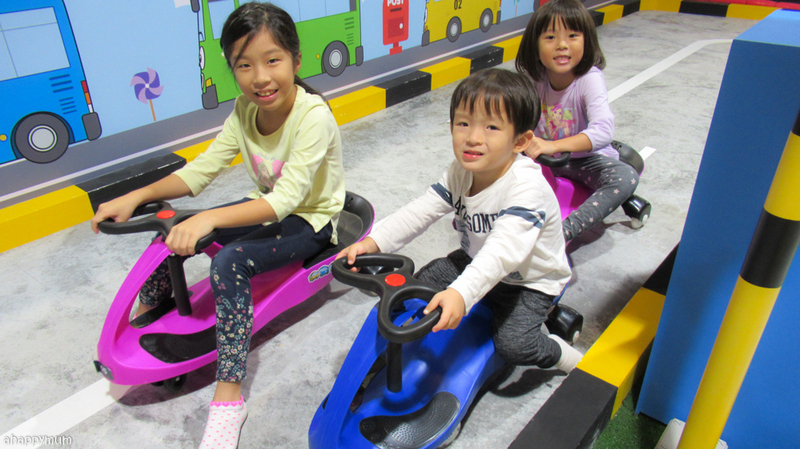 So, we still made our way to Tayo Station for some indoor playground fun and yup, it was nice to see their smiles as they explored the place and were especially fond of the road circuit which allowed them to drive their own 'cars'! It was also a relief for me at night because the hubby would come and join us after his work and at least I had another pair of hands to help me out with the sick kids. We would snack in the room, watch a movie together and just enjoy each other's company - which is precisely what a staycation should be about too. 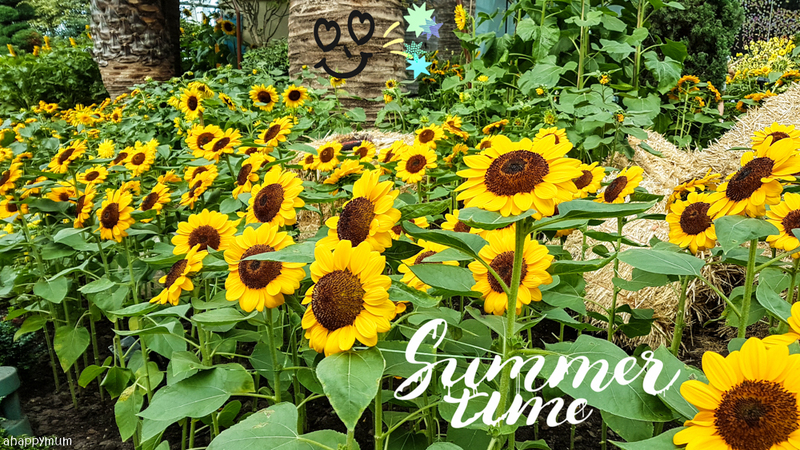 On the second day, we visited Wild Wild Wet and I was so happy that I managed to get my mum to join us on this fun day out! Haha, okay, I admit it was also because I knew I needed someone to accompany the girls for some of the rides since I would probably be stuck with the toddler the whole day. Still, it was an awesome decision because the girls could spend time with their grandma and make lasting memories too! We had dinner with my parents and they were really worried about Asher - who had two previous cases of pneumonia - and were anxious to see that he couldn't stop coughing. They gave me advice on how I should feed him medication or even bring him to KK hospital for a check up. Perhaps I was too chill but I kept telling them that it would be fine, that medication was not necessary yet, that we would continue with the staycation but I promised to keep an eye on him and make sure he recovered soon. I guess, sometimes, we just need to believe more in ourselves and our mother's instinct. Thankfully, this boy was strong enough and he was much better by the time we checked out, phew! 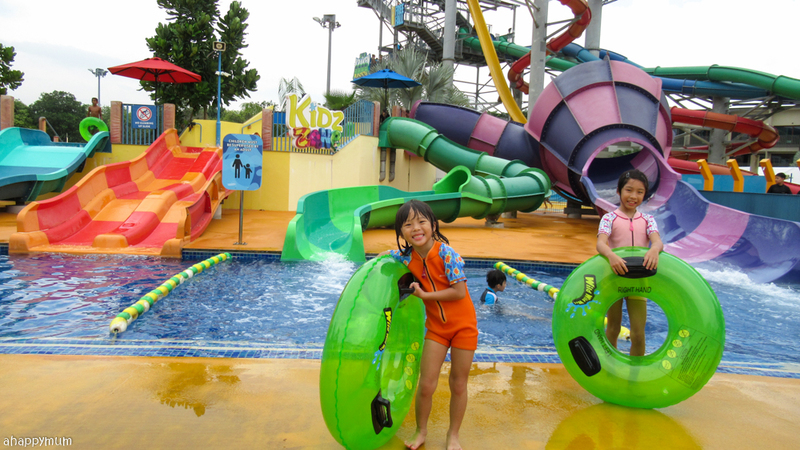 Anyway, back at Wild Wild Wet, the Kids' Zone and Shiok River were fun and the kids had tremendous fun going down the slides, climbing onto the tubes and winding through the river. Even though it was drizzling, we decided not to spoil the fun for the girls and let them continue since the rides were not closed. I tried to keep the toddler, who was fussy and didn't want to let go of me or play with anything, by my side at all times and stayed under the shelter or covered him with a towel whenever we had to be out in the rain. 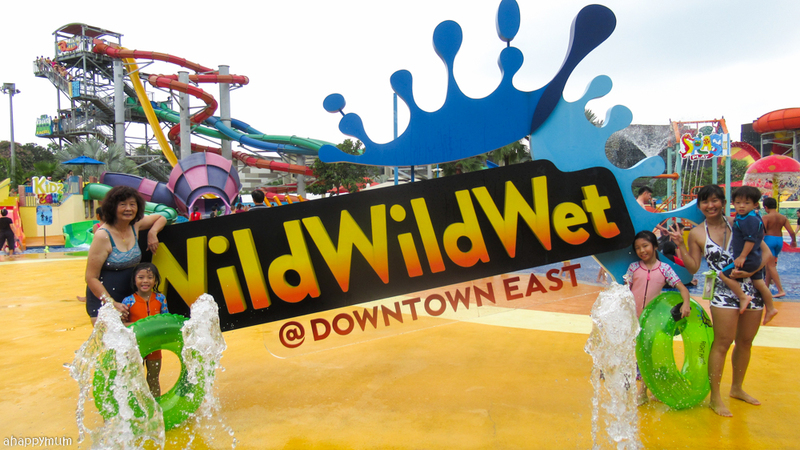 The most exhihilarating ride in Wild Wild Wet has to be Free Fall where you literally drop down a vertical slide from a height of six stories! A little crazy, right? 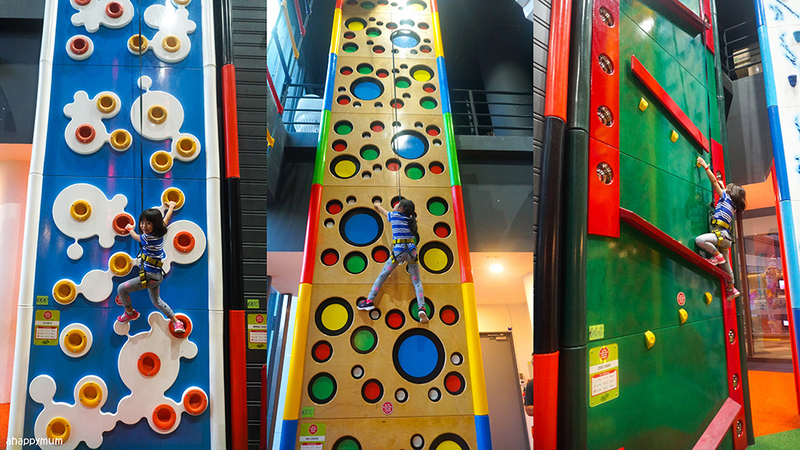 It was even crazier to hear my firstborn say that she wanted to give it a go and to hear the secondborn whine about not being tall enough so she wasn't allowed to try. 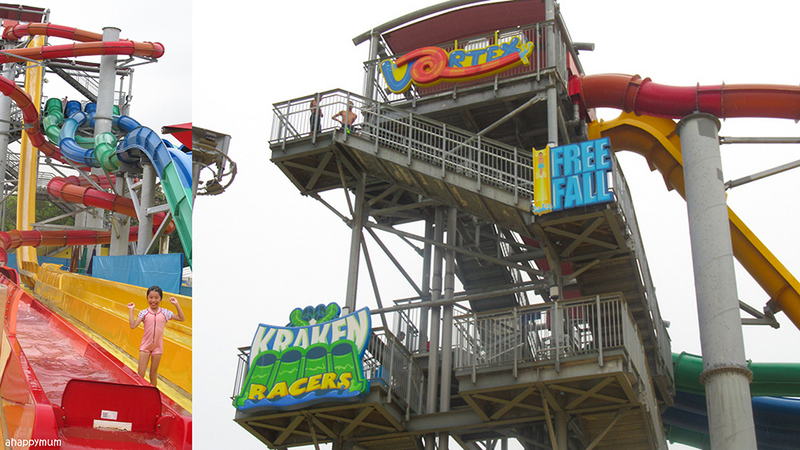 Gosh, these daredevils of mine! I don't know where they get their confidence from when it comes to going on roller coaster rides or heart-pumping rides like this but I'm just happy to see that they are willing to try and that they dig that adrenaline rush as well as the sense of achievement after. To Angel, I'm so proud you did the free fall even though you said you only wanted to do it once, haha. I'm also so thankful that you were brave enough to do some of the rides yourself when Popo was tired to climb up the stairs! 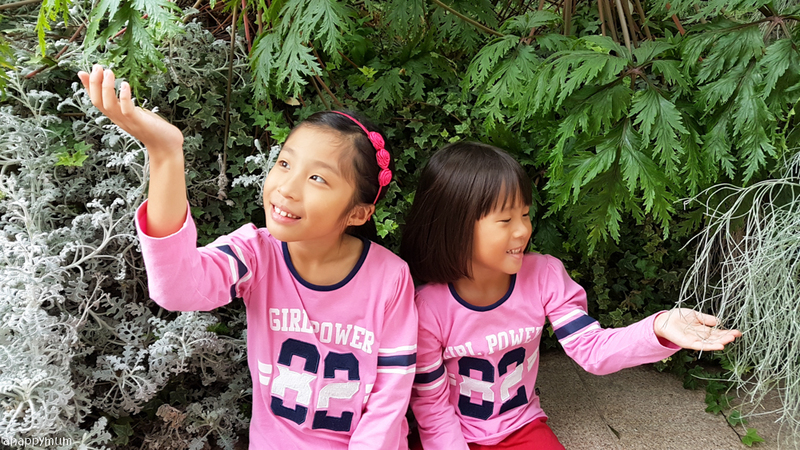 Soon, your Meimei will be able to join you on all of them and you girls can have a ball of a time together! As for my mum, I would most definitely give her the Coolest Grandma of the Day award! 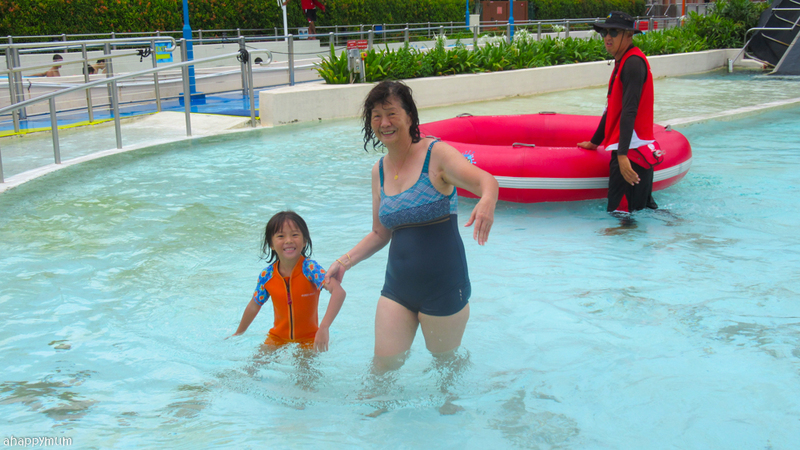 I mean, seriously, which grandma at the age of 65 goes on superman rides at such swift speeds that water splashes into her face umpteen times, sits under the giant tipping bucket and loves the 'waterfall' feeling, climbs up countless stairs just to accompany the granddaughters for ride after ride, tries again and again to climb and sit on the float in the lazy river before she finally succeeds? Yup, that's my mum - the person who inspires me to be a better person in more ways than one. I hope I can be as cool as you are when I become a grandma someday too. That wraps up our busy month of September and I hope it is a reminder to my kids and myself that we must always believe in ourselves and never be afraid to reach for the stars. Till more updates in October!